So, while I was uploading my latest vlog on YouTube at some stupid hour of the (sort of) morning yesterday, and I saw that everything was showing eights. Now, I’m not particularly superstitious, or Chinese, but I just thought it was kind of interesting. Just like many Christians find triple 7s to be some how holier (check out this Stuff Christians Like entry), I felt the need to take a screen shot as if it was some kind of rare and magical occurrence. 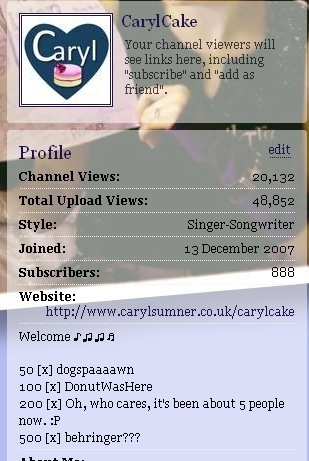 But then today when having a gander at my YouTube page, I find I have 888 subscribers. I’m not entirely sure what I’m getting at here, but I’ve found that tiny conincidences are an infinite source of entertainment to me. And since it’s the Internet in here, I’m sure I’m not the only one to enjoy little things like this.